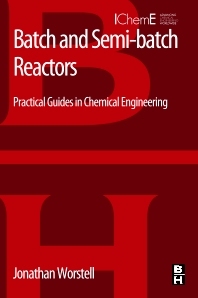 Batch and Semi-batch Reactors: Practical Guides in Chemical Engineering is a cluster of short texts that provide a focused introductory view on a single subject. The full library presents a basic understanding of the main topics in the chemical process industries, allowing engineering professionals to quickly access information. Each ‘pocket publication’ can be easily carried or accessed electronically, giving users a highly practical and applied presentation of the first principles engineers need know on a moment's notice. The focused facts provided in each guide help users converse with experts in the field, attempt their own initial troubleshooting, check calculations, and solve rudimentary problems. Practicing engineers (primarily chemical engineers). Jonathan Worstell earned his Physics degree from Northwestern University then switched to the chemical sciences, earning an MS in Chemistry from Ball State University and a PhD in Applied Chemistry from Colorado School of Mines. Dr. Worstell worked at Eli Lilly and Company and Northwestern University Medical School prior to starting a thirty year career in the petrochemical industry. After retiring from the petrochemical industry, he began an academic career at University of Houston where he teaches senior level chemical engineering courses. Dr. Worstell also consults with several global petrochemical companies.